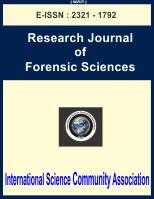 International Science Community Association are publishing an international peer reviewed journal Research Journal of Forensic Sciences. It is the vision of International Science Community Association to publish research papers, research articles, review papers, mini review, case study and short commutations in all areas of human study without financial restriction. Coverage Area: Researches in the field of Forensic Sciences which including forensic pathology, forensic medicine, forensic medical law, forensic nursing and training, medical disciplinary procedures and other forensic aspects, clinical risk management and performance, forensic genetics, DNA analysis, forensic psychology, forensic toxicology, forensic anthropology, criminology, serology, narcotics, transportation medicine, accident investigation and mass disasters, restraint injuries, bloodstain pattern analysis and identifications, death and care in custody, death investigation and causes of death, crime, fingerprints, footprints identification and investigations, drug and alcohol misuse, drink and drug driving, drug analysis and identifications, suicide, torture, sexual assault, profiling, domestic violence, clinical governance and human rights, report analysis and identifications, validation, licensing and certification of doctors, etc.